Mariel and George are one of the most fun and adorable couples we have ever met, just full of life and love. 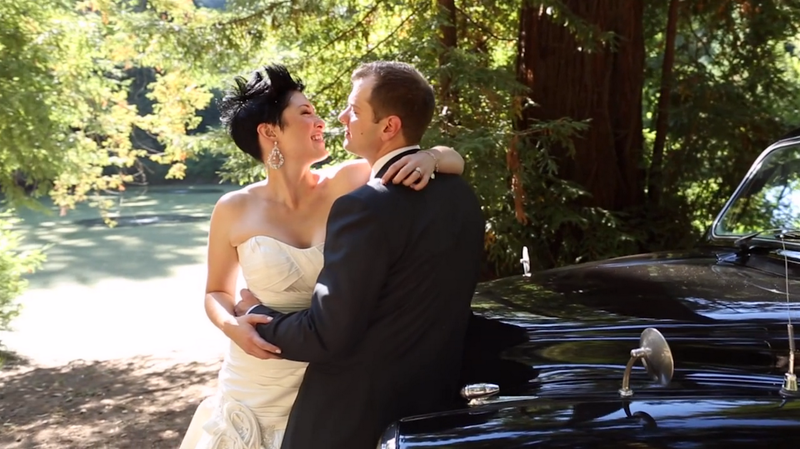 They were married at beautiful Nestldown, under the shady redwoods. They did rock, paper & scissors during their ceremony to see who would say their vows first! Mariel infused their celebration with fun handmade School House details (she's a teacher). She made wedding day report cards, ad libs, and fortune tellers, and each table marker was a library book, with old school photos of themselves. Even milk and cookies were laid out as a bedtime snack. We got to work with Lindsey and Nathan of Bellalu Photography who always make the day fun! Amy Frugoli of Twitterpated Weddings did an amazing job, along with Kellye Clifford of Precious and Blooming, Sweet Tooth Confections who did the "bake sale" desserts, and the catering by Thomas John was amazing, one of our absolute favorites of the Bay Area. The most amazing group of wedding professionals ever!!! Everyone made the day just perfect and Luke and Pamela captured every beautiful moment!! Simply AMAZING!! !